The accommodation is spacious with king or single beds as required with a large ensuite bathroom (shower) and a small well equipped kitchen for those occasions you would like to stay in. The French doors open out onto a patio where you can enjoy breakfast. A barbeque/braai is provided. The patio leads off into the pool area, also equipped with table and chairs to use at your leisure. The large sash windows look out onto the mountain and into the garden. Pear Lane Bed & Breakfast now has full satellite television for guests and wireless internet connection is available. Phone cards for calls to family overseas and recharge vouchers for prepaid mobile phones can be purchased locally. No. 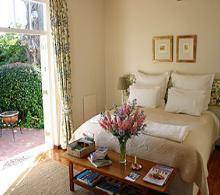 3 Pear Lane is situated in the heart of Newlands Village, Cape Town, South Africa. With the beautiful Devil's Peak as your backdrop, you will be enticed to visit Table Mountain, only 10 minutes away. Enjoy easy access to Cape Town's most popular attractions from these peaceful and lush surroundings. Off-street parking is available.